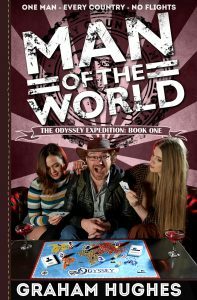 MAN OF THE WORLD is the gripping account of the first year of British adventurer Graham Hughes’s daring Guinness World Record™ attempt to visit every country on Earth using only surface-based transportation, told with refreshing candour in his own words. Buckle up for a rib-tickling multinational caper of courage, tenacity, love, friendship, danger, panic, passport stamps and geo-politics, washed down with copious amounts of alcohol. The Odyssey Expedition is the true story of the first successful expedition to every sovereign nation on Earth without flying by famed travel adventurer Graham Hughes! The expedition spanned 1,492 days (that’s over 4 years) and over 220 countries and territories (all 193 members of the United Nations and then some). He did it alone, on a shoestring budget and with no professional support (save that of his incredible friends and family). Along the way he made an eight-part TV show for Lonely Planet which has been shown around the world on the National Geographic Adventure channel and the Travel Channel. And he even set a new Guinness World Record (in fact two). It is a lot of places, a lot of traveling, a lot of things that went wrong, a few things that went right, and a lot of hilarious anecdotes. With too much to cram into one book The Odyssey Expedition is being published in 3 volumes! Residents of the UK can purchase a signed copy directly from Graham at his website GrahamDavidHughes.com or unsigned copies at Amazon UK.